Throughout the year here at Sky Birds of Prey, we tour the UK with our extensive collection of birds. We pride ourselves with putting on educational, entertaining and exciting flying displays and static bird displays at shows and fetes across the country. We offer a range of breathtaking displays, art classes and experiences all at the push of a button. Birds of Prey are Predators at the top of the food chain. As a result, they are complex creatures with their own habits and characteristics. Our displays build on the unique qualities of each bird. We demonstrate the variety of flying techniques adopted by the different species of bird, whether they be a hawk, falcon or owl. Our team make the displays not only visually exciting, but educational and above all, fun! Audience participation is not uncommon! We also have working dogs that work in harmony with our birds, adding a whole new dynamic to a flying display. If you think you don’t have the room for a flying display, think again. We can adapt to almost any size of venue. 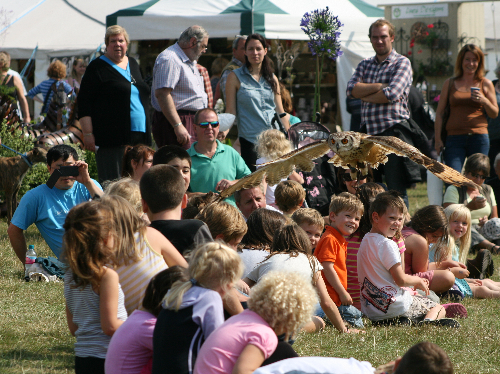 There is always a static display where the audience have the chance to get up close with our birds. Learn all about them from our experienced falconers and don’t be afraid to ask questions! Furthermore, the size of the stand can range from just 2 to 20 Birds. We also offer a photographic service which gives customers the opportunity to have a picture taken with one of our feathered team! Get in contact with us today to book your special event. Follow us on social media to keep up-to-date with up coming events throughout the year!